Beatles song mystery solved using statistics . Beatles Radio: The Beatles, Solos, Covers, Birthdays, News The Fab 4 and More! 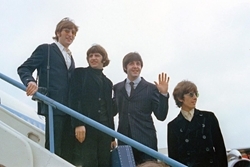 This 1966 file photo shows The Beatles, from left, John Lennon, Ringo Starr, Paul McCartney and George Harrison as they leave London Airport on their trip to the U.S. and Canada. Researchers from Canada and the U.S. have used mathematics to unravel one of the greatest musical mysteries of modern era: Who wrote In My Life, a nostalgic rock ballad on the Beatles' 1965 album Rubber Soul.